A few days ago I went through my refrigerator and collected all the past-their-prime produce in the vegetable bin. This included some wilted celery, a couple of carrots and an onion. Instead of throwing these in my compost bucket, I made a savory vegetable broth with them that I can use in the future for soup. Here's how. First, chop the vegetables along with a clove of garlic or two. Add some salt, pepper and seasonings. Be creative. Add water and put on the stove to simmer. When the vegetables are done, taste the broth and adjust seasonings to taste. Then, pour the broth through a strainer into a jar. The broth can be stored in the refrigerator for several days. Or, it can be frozen for use at a later date. Finally, DO NOT throw the cooked veggies into the trash! Put them in your compost bucket where they can be recycled into your compost pile. A while back I wrote about how a wily chicken figured out how to get in one of the nest boxes, even though we had put milk jugs in the boxes to keep them from sleeping in the boxes. I ended up leaving the wildlife camera in the chicken coop for several days and learned a lot about chicken behavior from the pictures it took. I have always wondered what goes on when it is time for them to go to roost. Here's what I found. At 5:53 pm (around dusk), one of the Rhode Island Reds (RIR) starts the process. However, instead of flying from the floor up to the roost bar, she approaches the roost from atop the nest boxes. Within 3 minutes, another RIR has joined her along with one of the buff-colored girls. Another RIR is on the nest boxes getting ready to join them. By 6:00 pm, four are on the roost bar with others on the floor apparently "thinking" about it. By 6:01 pm, all but one are on the roost bar. And, at 6:02 pm, all seven are on the roost bar attempting to get settled. Eventually everyone settles down for the night. But, even after lights-out, they still get restless and shuffle around a bit. And then settle down again a few minutes later. I found this to be true all night. Every hour or two one of them would stand up which would cause a disturbance among the others. They'd all shuffle around a bit only to settle down again after a couple of minutes. I'm not sure if they were even awake during these times. It made me think that, in regards to sleeping, they are not much different from us humans. What do you do on a cold rainy day in the late winter when you can't go outside? This is the question I asked myself recently when faced with this situation. There were a multitude of things I COULD do .... dust furniture, mop the kitchen, clean out a closet ... the list goes on. Well, I wasn't in the MOOD to do any of those things. Then, I looked across the kitchen and saw a basket of cayenne peppers that I dried last fall. I even wrote a blog entry about how I dried them. Well, now was the time to do something with them, I decided. I wanted to make a powder out of them, like you buy in the spice section of the supermarket. The first step was to get the seeds out of the peppers because you only want to process the red skin. Just break the stem end of the pepper off. Most of the seeds are located in the stem end. Now, tear the rest of the pepper into pieces and remove any more seeds you find. Did I mention you might want to wear rubber gloves for this step? Next, load the pieces into the "spice" grinder which is really just a coffee bean grinder. This is what it should look like when finished. Pour into an empty spice jar you have saved from store-bought spices. And there you have it, your own home-grown, home-made Cayenne pepper spice! I recently bought four baby chicks. Did we "need" them? Probably not, but once you become a chicken owner, it is hard to stop! The chicks are SO CUTE and hard to resist. So, last week while shopping at our local Atwoods farm store, I was drawn to the baby chickens and ducks they had for sale. We have 7 mature chickens - 3 old gals that are going on four years old and 4 younger ones that I bought last year. 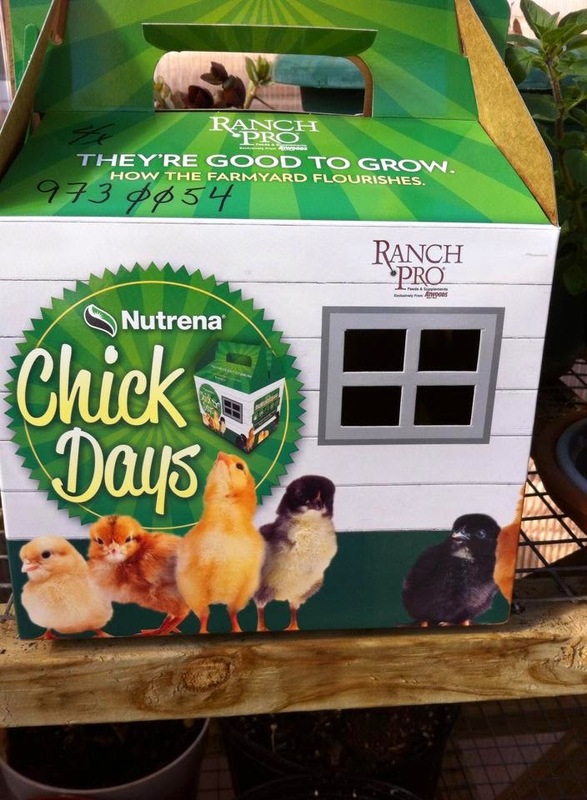 Chickens are not long-lived and I decided the older ones may not be here much longer, so I reasoned that we NEEDED some chicks to replenish our flock in case the old girls cross over the rainbow bridge to chicken heaven. Once I got them home, I set up a "brooder" for them. This is simply an enclosure that is small and free of drafts where they will be safe and warm for a few weeks until they get feathers. For my brooder, I used a large black plastic tub. Added a layer of wood shavings to it. These can be purchased in bulk from any farm store. The brooder should be put in an enclosed area where it is safe from predators and will be free of drafts. I put it in our small 8X10 greenhouse on the south side of our house, but an unheated garage would be fine. The final pieces of the setup are a feeder, a waterer and a heat lamp. Here it is all set up and ready for the chicks. The store provided a little box for transportation. The chicks were banded to indicate they were females. Female chicks are called "pullets". The band is metal and should be removed. Some folks use a pair of needle-nose pliers for this task, but I had trouble trying to bend the metal to get it loose while holding the chick. So, I used a pair of wire cutters to cut the end off. This worked very well. Once the chicks were "un-banded", I put them in the brooder. They seem right at home and went about exploring their new home. It is hard to believe that in a few months they will be full grown hens! Stay tuned for updates on their development! As I write this, there is snow on the ground and spring seems a far way off. However, it's already time to start tomato, pepper and herb plants for the 2015 garden. The past 3 or 4 years, I have used a method I saw on the internet that uses row trays. This method saves space and I can start a lot of varieties of plants in a small space. Here's a blog entry I wrote on this method. I didn't start out using this way of starting seeds. Gardening is a creative endeavor for us and each year we build on previous years' successes and failures. The first year we decided to start our own tomato and pepper plants, we didn't have the row trays described in the above article. I'm not sure what gave me the idea to use those clear clam shell containers, like you buy berries in at the supermarket. Maybe it was just that they reminded me of miniature greenhouses. And, although I have started using row trays for the bulk of our seeds, I still use the clam shell method for most of my herb plants....mainly because I only grow a few types of herbs. A row tray has 20 rows in it and I don't need that many for herbs. Today, I planted chamomile using the clam shell method. There are two different types of chamomile, Roman (or English) chamomile, a perennial, and German (or Hungarian) chamomile, an annual. I planted the German type. I believe it has the best flavor for tea. To prepare the clam shell, I cut a small piece of newspaper to fit in the bottom and filled it with damp potting soil. Chamomile seed is tiny, almost like dust. To plant, I scattered the seed over the surface of the moist soil and gently pressed it into the surface. Next, I sprayed the soil with water using a spray bottle. You don't want to use a regular plant watering can because the rush of water will wash the seed away. Next, a very important step is to label the container. I learned this the hard way. Don't ask! It's a bad memory. Finally, I set the clam shell on a heated mat under lights to give the seed a good start in life. This is an easy way for the home gardener to use if they want to start their own seed without investing a lot of money in seed-starting trays and equipment.